As we age, our teeth change color. This process is natural. Our enamel weakens the older we get due to wear and tear. When the white coating is no longer as durable as it used to be, a yellowing effect may take over. Smoking is hazardous for your body overall. The worst result that comes from this addiction that can be hard for some people to break is cancer. Then, smoking can affect the skin as it causes it to sag and wrinkle. Damaging your enamel is also another adverse effect that results in ingesting or chewing tobacco products. The chemicals found within these substances darken teeth over time. For your oral health to be its best, you need to make sure that you brush your teeth day and night and floss as well. Otherwise, plaque or bacteria will build up on your teeth causing discoloration. Other ways to prevent bacteria from forming is tongue scraping and most importantly, making regular visits to your dentist so that they can assess your oral health. Some medications or antibiotics can cause the teeth to darken. One example is doxycycline. Another example is some chemical components found in blood pressure medication. Talk to a physician about the side effects. While not common, chemotherapy can also cause tooth discoloration. This cause result in teeth turning brown versus yellow. You may be surprised to find out that yellowing of the enamel is hereditary. It’s a genetic trait that you may have inherited. There are many ways to whiten discolored teeth. Whitening strips are affordable, effective, and user-friendly. 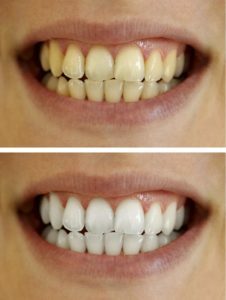 If the yellowing of your teeth is severe, then see a dentist about professional bleaching or other methods that may be best for you. This entry was posted on Thursday, March 28th, 2019	at 12:30 pm	and is filed under Teeth Cleaning	. You can follow any responses to this entry through the RSS 2.0	feed. Both comments and pings are currently closed.